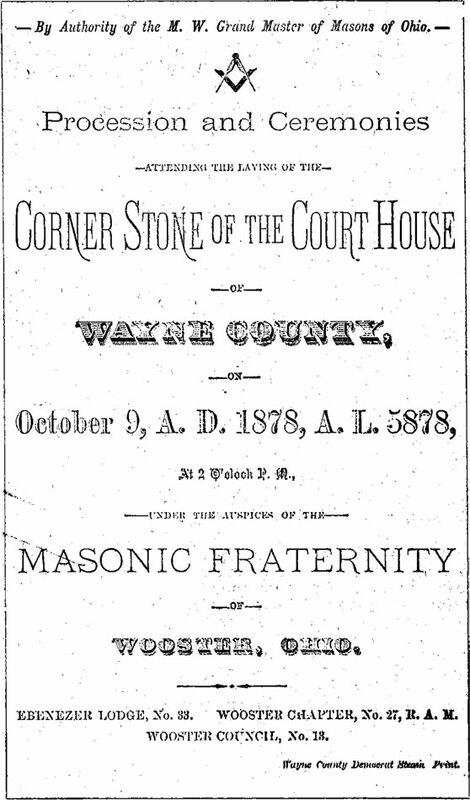 What’s in the Wayne County Courthouse Cornerstone? You are here: Home / History Bytes / What’s in the Wayne County Courthouse Cornerstone? 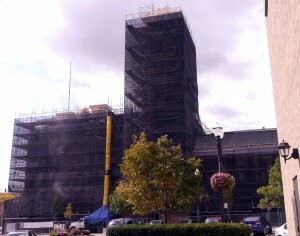 The Wayne County Courthouse under construction in Wooster, Ohio in October of 2015. The historic Wayne County Courthouse building has been undergoing a number of restorations and renovations this year and has been shrouded in black construction screens and scaffolding for a number of months. There’s been lively arguments, for and against, whether it was a good idea to pour more money into the 137-year-old building to keep it in tip-top condition and functioning properly for the public and civil servants that have to use it every working day. Don’t worry, not much has changed: they were arguing about whether they should try to repair the prior Courthouse that had rotting timbers and unstable brick walls or knock it down and spend what was then a large amount of money to build our present Courthouse in 1878. So arguing over the Courthouse’s costs and future is a good old Wayne County tradition that is likely to continue for many future generations. 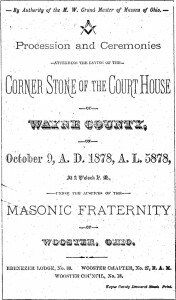 In any case, while reading an old 1967 Daily Record newspaper for a research project an Off The Tombstone column by Eppie Taft caught my eye because it included a picture of the front page of a well-preserved copy of the program used on October 8, 1878 for the laying of the Wayne County Courthouse cornerstone by the Masonic Fraternity of Wooster, Ohio Ebenezer Lodge, No. 33, Wooster Chapter, No. 27, R.A.M. (Royal Arch Masons) Wooster Council, No. 13. My curiosity nerve was struck and i figured if the laying of the cornerstone was such a big deal there might be more information in a local 1878 newspaper around that date, so i pulled the microfilm for 1878 and sure enough i found an interesting article in the Wayne County Democrat dated October 9, 1878 on page 3 that described exactly what our citizen predecessors put in the Wayne County Courthouse cornerstone and left us a beautiful description of the copper box placed in the stone and all the items stored inside it. Ebenezer Lodge, Officers and Members. Wooster Chapter, Officers and Members. Wouster Council, Officers and Members. Copy of Dalton Gazette, Wooster Republican, Doylestown Journal, West Salem Monitor, Shreve Journal, University Reporter, Fredericksburg Herald, Orrville Crescent, and Wayne Co. Democrat. List of Wooster and Wayne County Bar. Report of the Insurance Commissioners of the financial condition of the Northwestern Mutual Life Insurance Company. Officers of the State of Ohio. Officers of Wayne County, and Judges of District. Report of Wooster High School. Statement of Taxation of Wayne County. Charges and By-Laws of Ebenezer Lodge. Proceedings of Grand Council of Ohio. List of Ebenezer Lodge for 1876. Proceedings of Grand Lodge of Ohio. Specifications of the Court House. Three reports of Wooster High School. Village and City of Wooster. Law authorizing the building of the Courthouse. Copies of Contracts for building the Courthouse. Douglas’s History of Wayne County book. Photographs of County Officers, and others, with list and signatures. Money–a Greenback, Gold, Silver and Trade Dollar, and paper, silver, nickel and copper fractions of a dollar, to the total amount of $7 dollars and 33 cents. The corner stone was then laid, with slow music played by the Wilmot Band. The Architect of the Courthouse, Mr. Thomas Boyd, of Pittsburg, Pennsylvania, presented the plumb, square and level to the Grand Master, who proved the stone, finding it perfect in all its parts, and accepted it. Now everybody knows exactly what’s in the cornerstone of the Wayne County Courthouse. Unfortunately, it is highly unlikely that any of the paper-based objects stored in the copper box within the cornerstone will be salvageable if the box is ever opened but the metal coins should still be intact and i bet they are worth more than $7.33 now.